Human skin is apparently a very energy-efficient conduit for transmitting data. A recent experiment achieved a rate of 10Mbps, which may put my Internet connection to shame. The experiment used small, flexible electrodes and took place at Korea University. The finding may lead to a new generation of medical devices that can monitor blood sugar or electrical activity in the heart. Such devices cut energy needs for a monitoring network by about 90 percent compared to wireless devices running on batteries. 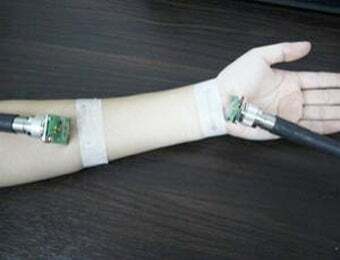 South Korean researchers placed electrodes about 12 inches (30 centimeters) apart on a person's arm, and found that the low-frequency electromagnetic waves travel easily through the skin without any outside interference. The South Korean study improved on past attempts by using tiny metal electrodes coated with a silicon-rich polymer, which allowed the device to bend at a 90-degree angle 700,000 times without incident. Each electrode was just about the width of three human hairs. This may not seem all that surprising coming from South Korea, known as perhaps one of the most wired places on Earth for Internet. But we can't help but wonder if the researchers hadn't been watching some Battlestar Galactica goodness, given the tendency for a certain Cylon (played by Grace Park) to plug data cables into her arm for a bit of computer-on-computer consultation — not that we're talking about brains communicating directly with devices just yet.